Several weeks ago, a sharia-adherent muslim named Sayfullo Habibullaevic Saipov drove a truck into pedestrians in New York City killing 8 and wounding several others. 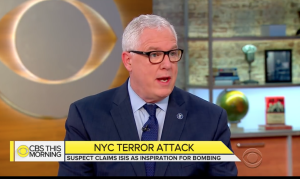 New York’s Deputy Police Commissioner John Miller said the attack had nothing to do with Islam. This week, a sharia-adherent muslim named Akayed Ullah wore an explosive vest that prematurely detonated, wounding Ullah and several others. Out of the blue? Is this a serious response. If NYPD believes this jihadi simply turned up out of the blue, it necessarily means there is no hope of preventing such attacks in the future. What propaganda are these “terrorists” consuming? These attackers, the Chelsea bomber, the 9/11 hijackers, and all the other muslim “attackers” in the United States have identified themselves as muslim waging jihad in the cause of Allah to establish an Islamic State (caliphate) under sharia. All Islamic doctrine mandates warfare against non-muslims until sharia is the law of the land on the entire earth. Has John Miller read any sharia? Do New Yorkers care about this incoherent leadership at NYPD? Thank goodness in both of these cases these jihadis openly stated their support for the Islamic State or we would still have no idea why they did what they did. The Deputy Police Commissioner of the NYPD (in his own words) conjures the vision of yet another federally scripted political misfit who knowingly, thus arguably with malice aforethought, represents a clear & present perpetual threat to the lives of the New Yorkers he has ostensibly sworn to protect. 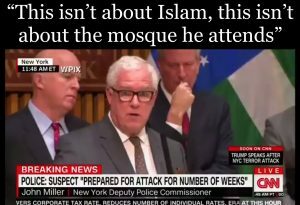 Indeed, the nineteen member cell of sharia-adherent Muslim savages who claimed the lives of 2777 innocent victims on 9/11 also turned up one day, literally, “OUT OF THE BLUE”. And as long as domestic law-enforcement entities in the United States continue to field the likes of said sycophant in command positions the country will continue its now sixteen year downward spiral toward an unspeakable draconian hell known as Sharia. Furthermore, the ever burgeoning number of sharia-adherent Muslim attacks on the “West” are ALL & DEMONSTRABLY linked to Islam’s declaration of war* on the United States per se, dated 22 May 1991, which FBI Special Agents were fortuitously able to seize from a subterranean basement in Annandale, Virginia in 2004. The “West”, and “ALL” incidentally, DPC Miller, include New York. Read it, you disingenuous nit-wit. *To secure (for a nominal handling/postage fee) an actual English language translation of said declaration of war against the USA, contact: http://www.securefreedom.org and reference GOVERNMENT EXHIBIT 003-0085 3:04-CR-240-G U.S. v. HLF, et al. The deception policy and the information about the the words such as tolerance, peace, terrorism and justice that when spoken the muslims know that there is a gap of meaning between western and muslim audiences.. The call to jihad is warfare against non believers and the goal is to convert the entire world by using propaganda, lies and terror. Who would tell them the truth, muslims know they are in danger is they speak from other muslims. The media and the politicians and businesses fearful of terror just speaking the truth gets one called racist….but as the knowledge becomes widespread the incredible deception and problem may someday get better policy to deal with it in my opinion. Islam is not a race, it is a doctrine…it is being taught and conversions are happening is all many countries. It is also far less a religion and it is a legal system that individuals who convert to Islam are expected to follow if muslim which is the root of terror. It is called sharia. The law claims speaking the truth is slander. Slander usually means untruthful statements. The truth is in the Quran speaking the truth becomes slander in Islam to protect the doctrine. It is considered criminal to tell the truth. So silencing of the truth it a main structure in Islam. The freedom to explain the facts ie truth is the structure for safety and the lives of Americans, since many Americans are seduced to this doctrine, they need to know the deception.